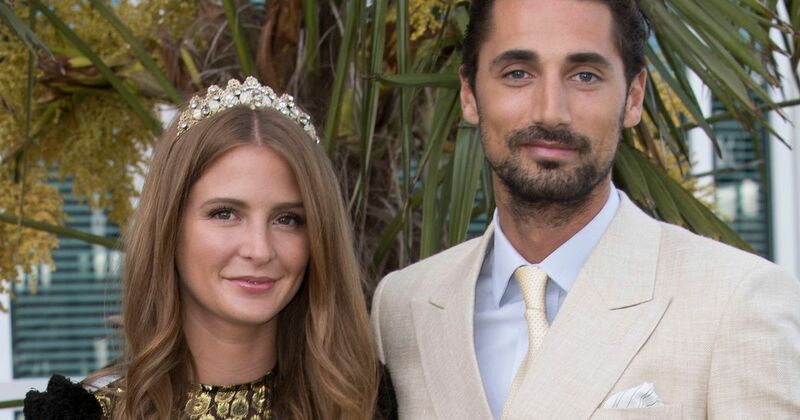 Millie Mackintosh and Hugo Taylor made their union official today with a lavish country wedding. The couple said their vows in front of 200 guests – but actually got married in secret earlier this week. The Made In Chelsea stars tied the knot in an intimate ceremony at Chelsea Town Hall three days earlier in front of just a handful of family and friends, according to Hello! But this weekend they celebrated their marriage in style at Whithurst Park, a Jacobean-style country estate in West Sussex, owned by Hugo’s uncle. They said ‘I do’ again in an outdoor ceremony before heading to a drinks reception held in a romantic walled garden. Afterwards guests enjoyed a lavish dinner and party. Millie – who’s first marriage was to Professor Green in a lavish ceremony in Babington House in 2013 – and her family were spotted in the 100-acre country house on Friday, while preparations were underway. A huge marquee with a glass roof was put up in the grounds of the house – though it looks like they’ll be lucky with the weather today – while bunches of white flowers and balloons were spotted at the venue too. Hugo posted a video inside the fancy Turnbull & Asser men’s suit store – Royal warrant shirtmaker, don’t you know – on Friday, fuelling speculation that this is where his wedding day suit will be from. Millie wore a Temperley dress for her wedding to Pro Green – who she split with in 2016, before rekindling a romance with her MIC castmate and ex, Hugo. The reality star spent most of this week in luxury, staying at London’s Bulgari Hotel, where she posted pictures of herself relaxing in their spa. She also took the time to get a few cosmetic treatments, like a light therapy facial at a clinic in Mayfair abd a teeth-whitening session at a dental clinic. Millie is said to have asked her friends Caggie Dunlop and Rosie Fortescue to be bridesmaids. Her second hen party last month was an altogether cheeky affair, as the girls ended up with naked waiters in their Cotswolds visit. A naughty shot shows two of her girlfriends reaching out to touch one of the waiter’s bare bums as they all pose with their backs to camera. Guests at the celebrations include Example’s wife Erin McNaught, Oliver Proudlock’s model girlfriend Emma Louise Connolly, Rosie Fortescue and Rosie’s sister Lily. Millie announced her engagement to Hugo last July. The couple confirmed the news after she was spotted wearing a huge diamond ring while they celebrated her birthday on holiday in Greece.